The decision to dive wet or dry seems somewhat generic until you seriously consider the key differences. We all now that the primary difference between diving in a wetsuit and diving in a dry suit is that diving with wetsuits involve getting wet. Whereas, diving with dry suits you remain completely dry. A wetsuit is designed to let water in and keep it in, thereby letting your body heat it up. The effectiveness of wetsuits, as far as keeping you warm, has to do with a combination of factors including its thickness, its intended use as well as the expected temperature range of the water at the five site. For further details on the specifics of selecting wetsuits for scuba diving based on its intended use and water temperatures refer to this blog post about wetsuits and cold water. The decision to dive wet or dry will often be made based upon a dive site’s water temperature as well as the water’s hazard/contamination level. However, there are a few divers who prefer dry suits regardless and prefer to dive in dry suits even in warmer waters. The wetsuit/dry suit question’s answer can seem rather obvious unless you consider a few key differences that distinguish them. Warmth. What they do is slow the amount of heat loss. Wet suits do this using a layer of neoprene and a thin layer of water trapped between that and the skin. Dry suits use air and a combination of undergarments. Buoyancy. Wetsuits compress with depth and lose some of their inherent buoyancy. Dry suits allow the diver to add air and compensate for the increased pressure at depth. Weighting. A wetsuit loses buoyancy at depth, a diver can become seriously over weighted due to suit compression. With a dry suit, the amount of buoyancy the suit offers stays more or less constant since the diver has the means to adjust for the increased/decreased pressure. Varying conditions. A large benefit of a dry suit is the ability to use the suit in various conditions. A wetsuit does not offer the flexibility of a dry suit to add or subtract undergarments to suit the water/surface conditions. Purchase cost. With the introduction of new materials and manufacturing competition, a quality entry level dry suit can be had for roughly the same price as a higher end wet suit. By varying the undergarments the diver can also avoid having to buy several different thicknesses of wetsuits. Cost of ownership. Once a diver buys a wetsuit there is very little maintenance other than proper rinsing. Dry suits require seals to be replaced, leaks attended to, boots or socks replaced, and maybe even the zipper. Used dry suits are sold to offset the cost of a new one! Another aspect of the wetsuit/dry suit issue is their intended use. Whereas both types of gear keep you dry and warm. Dry suits are made to be loose fitting while wetsuits are made to be form fitting. Therefore, dry suits involve more drag so they wouldn’t be the first choice for activities such as surfing. To further complicate the matter, wetsuits are designed for performance by specific type of water sport and with numerous options such as neoprene thickness and seam types. Therefore, it wouldn’t hurt to seek the advice of an expert when selecting your next wetsuit. 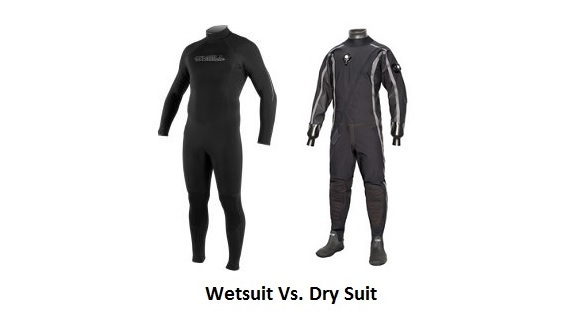 See next page below for an informative video description of the wetsuit vs drysuit differences.